Chuck Deardorf perches on a stool at the back of the stage, the best view of the audience. This vantage point is ideal for a bass player’s role as harmonic backbone and center of gravity for the groove. Deardorf scans the crowd and pilots the band through familiar waters like a seasoned Northwest ferry captain. The club’s wooden stage amplifies low notes, making inexperienced bassists produce unfocused booms. But Deardorf’s tone is even and clear over the entire neck of his German acoustic bass, built in the late 1800’s. His fingers crawl over the strings like a spider. Quick solo phrases end on a brief sustained note with a touch of vibrato. His sound is refined, precise, fluid – reminiscent of ECM recordings from the late 1970’s. Deardorf wears a black mock turtleneck, dark slacks, and comfortable loafers. Although this is “gig attire,” he doesn’t wear flashy clothes off the stand. His eyes sparkle with wisdom behind frameless glasses. Making eye contact, he speaks quietly, directly, with a generous dose of self-deprecating wit. His wavy dark hair sweeps back and does not cover his ears. His neatly trimmed beard turns gray at the front of his chin and the back of his jaw line. After earning his degree, Deardorf put his trombone in the closet to answer the call of the bass. “On trombone, the slide positions have to be in your head,” says Deardorf punching the air in a pantomime of playing. “But on bass you can look at notes on the fingerboard.” Deardorf holds his left hand near his cheek, turning his head to stare at his index finger, pantomiming his words. The bias at Cornish is toward performance over scholarly research so all teachers play with student, faculty, professional, and community ensembles. 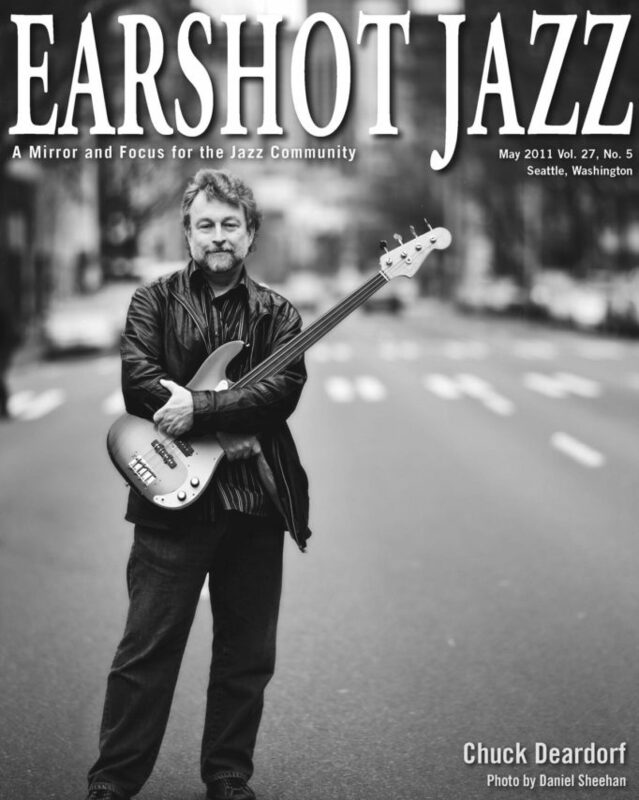 For 30 years Chuck has been the first call bassist at Seattle clubs whenever traveling veteran jazz musicians need a local rhythm section. Deardorf performs regularly in bands led by pianist Neto and vibraphonist Susan Pascal. This March, while on sabbatical from Cornish College of the Arts, Deardorf released a new recording – Transparence. Deardorf has accompanied notable artists on more than 30 recordings as a sideman, but Transparence is first CD as a band leader. This new project sums up Deardorf’s musical influences, partnerships, and artistry from decades of teaching and playing jazz. “I couldn’t jump right into John Coltrane and Charlie Parker when I was younger because my ears weren’t acclimated. I just didn’t get it,” says Deardorf. “I came to jazz through Rhythm and Blues, rock jams of Miles Davis with John McLaughlin, and fusion by Weather Report. My early listening was Pat Metheny’s Bright Size Life and Keith Jarrett’s European band with saxophonist Jan Garbarek. “One of the first jazz recordings I heard in college – the first tune you learn as a bass player – was ‘So What’ on Miles Davis’ Four and More ’64. In the aggressive playing I recognized that rock and roll attitude of not worrying about mistakes, where the rhythm section energy is crackling with precision, and breathing,” he reminisces. On Transparence, a nod to Pastorius comes on the Beatles’ “Dear Prudence.” Starting with a harmonic chime that sounds like the old pendulum clock in Deardorf’s living room, the bass states the melody over a descending acoustic guitar figure. Deardorf’s opening notes swell in volume. When the drums kick in for the groove, he opens fire with Pastorius-like machine gun bass notes. After an overdubbed bass solo, the meter switches from 4/4 to 7/4 for the drum solo and closing melody. The time is so solid the groove does not budge. “I like guys who can do a lot of different things – players who have a broad approach with no walls between genres or styles.” Deardorf demonstrates this on Transparence by mixing up swinging standards, driving rock, Latin fusion, free bop, and delicate ballads. Even though each track includes melodic statements and solos by the bass, the sound keeps changing throughout the recording because no two tracks have the same instrumentation or personnel. Each of the tracks has a surprise twist. For example, the opening tune “Collage” drops the listener into the middle of everyone simultaneously improvising over the chord changes to “You’d Be So Nice to Come Home To.” The melody, with quotes from several bebop tunes, only comes after the solos and is played in unison, drums and bass included. After the melody, sax and piano trade fours and the key modulates on the last section of the song form. On “Alone Together” Deardorf lays down a steady repeated figure that allows guitarist Bruce Forman to stretch time and erase bar lines and avoid playing on the first beat of a measure. The high level of listening and interplay dove-tails the end of Deardorf’s solo with the start of Forman’s as they spontaneously play syncopated descending lines together. Antonio Carlos Jobim’s “Zingaro” features an urgent but gracefully arching solo by guitarist Rick Peckham. The balanced melodic and rhythmic counterpoint between solo and bass builds to a two-note peak by the guitar with just enough distortion to let out a soulful cry. Pianist Bill Mays and Forman play duets with Deardorf on “Moon and Sand” and “Sweet Lorraine” respectively. The groove is so strong and the communication so intimate on both of these cuts that drums are not missed. “Creatinine” recalls the freedom of McCoy Tyner’s “Passion Dance.” Added to the sounds of the band are overdubs and signal processing. The group progressively drops the constraints of 4-bar phrases, written harmony, and finally pulse. While on sabbatical, Chuck plans to put energy behind the release of Transparence, compile materials from his teaching into an instructional book for bass players, and spend more time with his family. Deardorf met his wife, vocalist Kelly Harland, in 1983 when they worked a lounge gig together. They married in 1989 and share a cozy home on a quiet street in Northeast Seattle. Their son Will was born in 1991. Harland documented Deardorf’s love and devotion to his son in her memoir A Will of His Own: Reflections on Parenting a Child with Autism. Five years ago, Deardorf was diagnosed with acute nephritis – “The inside of my kidneys are slowly fossilizing.” Inherited from his father and grandfather, the main symptom is fatigue. He regulates his diet and blood pressure. Now that the disease has progressed to stage 4, he would need to begin dialysis in a month or two. Bassist and long-time friend Bruce Phares set up a Facebook page Let’s Find a Kidney for Chuckie D! to aid in the search for a kidney donor. Luckily, one of Chuck’s brothers was a match so they went under the knife in late April. It will take more than a kidney transplant to knock Chuck out of his groove. In March, he headlined the Earshot Jazz Golden Ear Awards and was honored by being inducted into the Jazz Hall of Fame. This summer he plans to teach jazz camps at Cornish and Centrum’s Jazz Port Townsend in July before returning to his full schedule in the fall. Visit http://chuckdeardorf.com/ to read more about Chuck.